Cast: Burgess Meredith, Kieron Moore, Dulcie Gray, Christine Norden, John Laurie, etc. 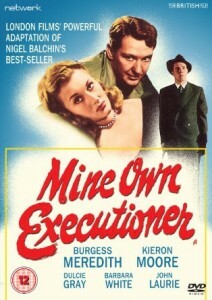 Background: Mine Own Executioner was the first of Balchin’s novels to be brought to the big screen and only the second screenplay that he wrote, following on from Fame is the Spur the previous year. Verdict: I don’t rate this film quite as highly as The Small Back Room but I do consider it to be the second best movie ever to have been made from a Balchin source. It is essentially a compressed and simplified version of the book but when adapting his novel Balchin stuck to it quite closely so that what appears on screen is generally a faithful representation of his original text. I don’t understand why Felix Milne was played by an American and not a British actor but Burgess Meredith is undoubtedly excellent in the role. Young Kieron Moore (only 22 when the picture was shot) is almost as good in his role as the schizophrenic Adam Lucian and standout members of the lower reaches of the cast include John Laurie as Milne’s colleague Garsten and Lawrence Hanray as the irascible coroner Mr Lefage. The film is hindered by a lack of drama until its climax approaches (one critic correctly observed that it was “too word-bound”) and it has a curiously stiff, ‘stagey’ appearance, almost as if Balchin had adapted it from a stage play instead of a novel. But the quality of the acting and the high level of interest generated by the psychoanalytical subject matter ensure that Mine Own Executioner is rightly considered to be among the best British films of the late 1940s.